NOW YOU SEE, NOW YOU DON'T. THE DISAPPEARING SHOE STYLE. Surely the most revolutionary silhouette introduced in the Paris Spring collections this year is the sensational new shoe silhouette illustrated today. It is called the "disappearing" pump, because, depending on the direction from which you look, now you see, now you don't. But it was born neither of whimsy nor any desire to startle. 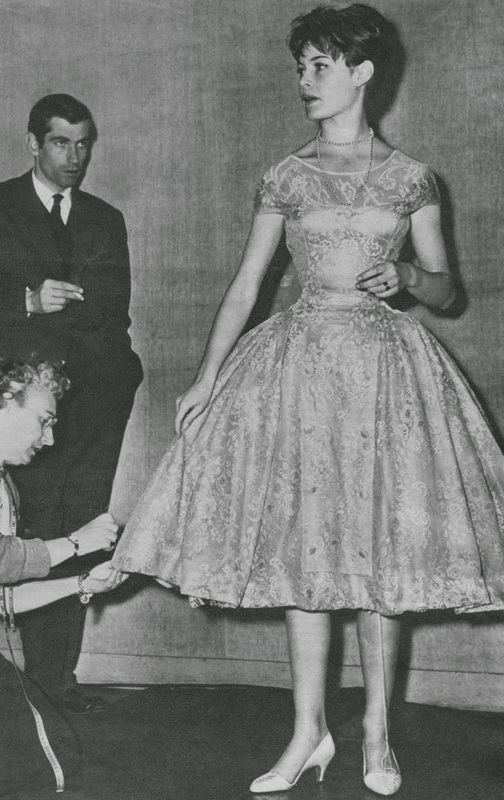 It is the invention of Hubert de Givenchy who has certainly been starting new trends (chignon-hats, whooshy-sleeved organdy blouses, orlon sweaters, etc.) since he set up shop in the Rue Alfred-de-Vigny at the age of twenty five - three years ago this month. 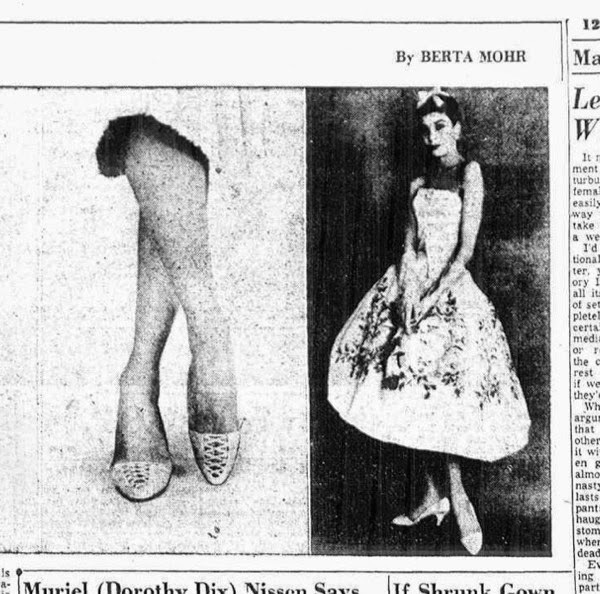 His purpose was to achieve a cool and foot-slimming shoe, as well as a chic one, naturally. His radical departure from conventionally conceived footwear was made possible by the new Italian-launched trend to soft glove leather shoes made without inside stiffening, so that the light-as-a-breeze leather can conform and cling to the foot. 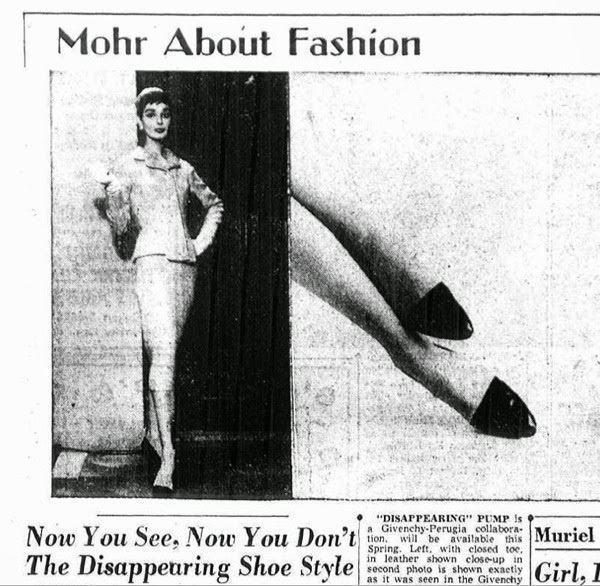 The result is a shoe which tries to achieve an almost invisible Silhouette, while covering the entire foot. 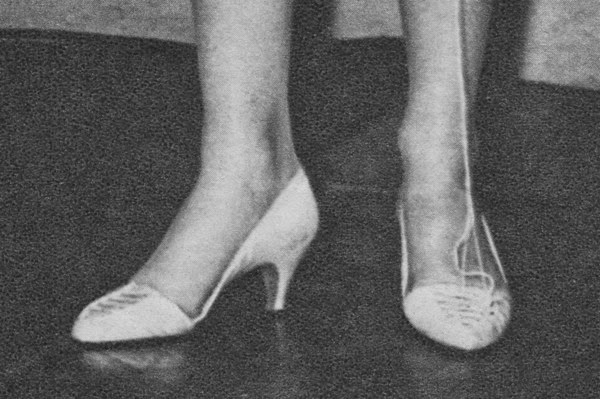 Viewed from the front, only the tiny point of the seemingly floating-in-air toe is visible: the very open side line adds height to the figure. from the back, the shoe looks like conventional slim heeled pump. The designer took his model shoe to Andre Perugia, the great Italian bottier, who executed it in closed and laced-toe versions,in leather, satin and printed fabrics. And these were the shoes shown through the Givenchy couture collection early this month. And in just a few weeks Americans will be able to wear it, as it is scheduled to be imported and available for Spring. "DISAPPEARING" PUMP is a Givenchy - Perugia collaboration, will be available this Spring. Left, with closed toe, in leather shown close-up in second photo, is shown exactly as it was seen in the Givenchy Paris collection earlier this month with his suit of pale tweed woven with vivid nubs, the elongated jacket front adding to the long, slim line of the figure.